We explore the best beaches in Kent and East Sussex — for your children, dogs and foodie friends — as we work our way round the South East’s beautiful coastline. It’s a funny thing that when you say you live in Kent, most people associate the county with market gardening, the high-speed train and cricket. What they largely seem to forget is the 350 miles of coastline. 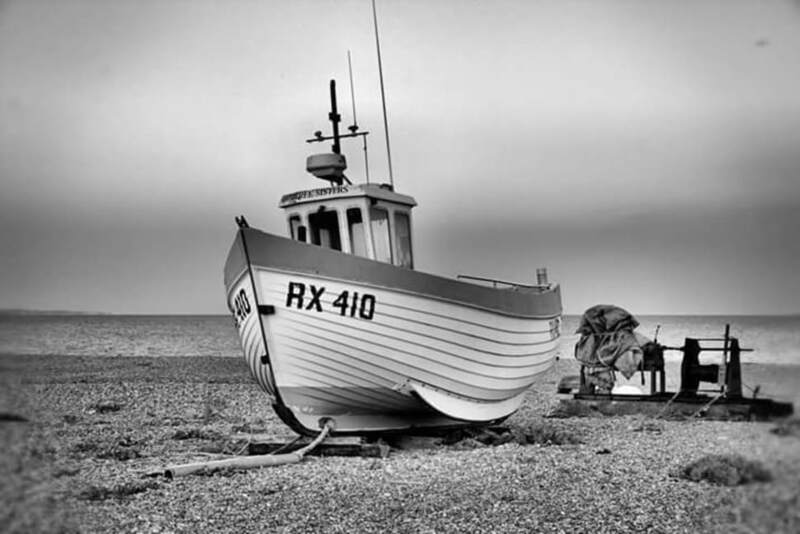 Well, at Hobbs Parker we’ve long known and loved our seaside and beaches and are happy to share our favourites – all within surprisingly easy reach of Ashford and Tenterden. Most are in Kent, but we’ve sneaked in a couple from East Sussex too as we’re close to the county border. So, working clockwise, like watching the clock counting down on a Friday afternoon, our first port of call is on Kent’s north coast – Whitstable. 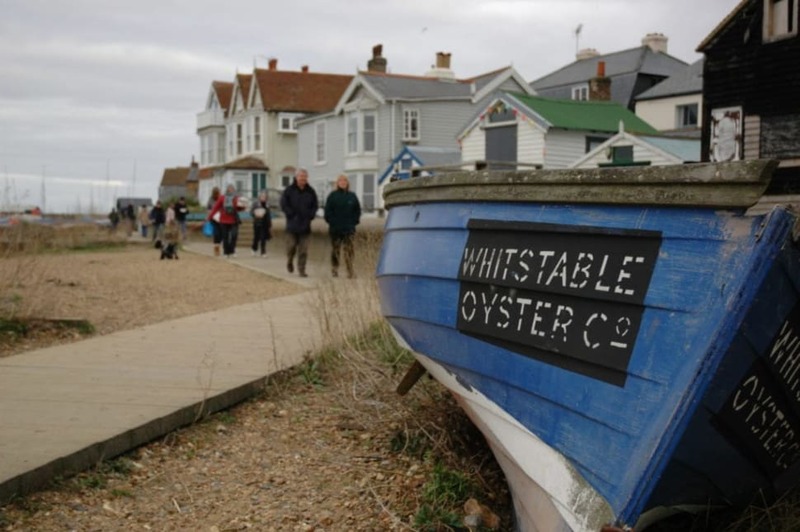 About 20 miles to the north and around 40 minutes by car, if the world is your oyster, then Whitstable must be at the very epicentre…. Famed for its oysters (there’s a whole festival for them in July), along with noted restaurants and galleries, some refer to the fishing town as Hackney-sur-Mer. It’s a winning combination of working harbour, zany beach huts, lots and lots of really good places to eat plus fun and fashionable shops to browse. Locals hang out on Tankerton Slopes, on the east side of the town. This is where you’ll see most of Whitstable’s glorious beach huts – stars of many a postcard, calendar and tea towel – painted in a dazzling array of colours and stripes. Some have even been given a touch of the Grand Designs, with wooden decks, glass and steel balustrades and funky lighting. There are fishermen’s huts you can rent and sleep in too. For a star-rated day trip out, here’s a tried and tested plan. Arrive early for a bit of vintage and antique browsing, take a picnic or book somewhere top-notch for lunch, followed by a swim or a paddle on the beach. Finish with ice cream, a snooze and finally, if you’re not too sunburned, a visit to one of the many fine pubs dotted throughout the town…. There are so many excellent eateries, it’s hard to name them all, but favourites we head back to again and again include The Whitstable Oyster Company (for fishing industry chic overlooking the sea), The East Coast Dining Room (for modern and inventive British cooking), Samphire (for local ambience and warmth) and Wheelers Oyster Bar (which has been serving the freshest fish and oysters for 160 years, so they must be doing something right…). Heading round the thumbs up promontory of Thanet which includes trendy Broadstairs and genteel Ramsgate, we come to the east coast. There the jewel in the crown is Deal, about 30 miles from Ashford and 42 minutes by car. 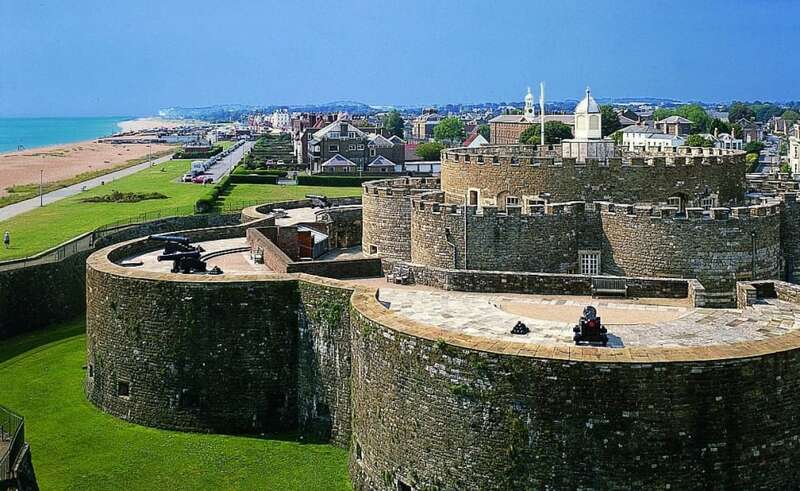 Deal is home to the real deal: not a castle made of sand, but a castle by the sand… And not just one, but two castles, little more than a mile apart. Both Deal and Walmer Castles are exceptionally fine examples of Tudor artillery castles, commissioned by Henry VIII as part of a chain of coastal forts intended to keep the French out. Today both are owned by English Heritage and make for an unusually interesting and rewarding visit to the seaside – not least as you can bike between the two along a seaside cycle route. Other than history, Deal offers gorgeous Georgian architecture, a splendid pier with a fun café at the end and plenty of small shops, bars and cafes. A couple of favourites on the seafront include 81 Beach Street – a light, art-filled restaurant serving modern British cooking – and The King’s Head – an imposing 18th century pub and guest house with wonderful floral displays and loads of outdoor tables serving happy families large plates of good food (washed down with Shepherd Neame beer). If only Deal was a little closer — great restaurants and, in my opinion, the finest golf course in Kent bar none. Situated about 22 miles due east of Ashford is one of the country’s busiest ports, Dover. It’s a scant 30 minutes down the M20 and while it may not seem an obvious destination, it’s one of our top coastal spots. What you need to do is….adjust your cuffs, straighten your tie, grab your walking boots – for the name’s Bond, James Bond. 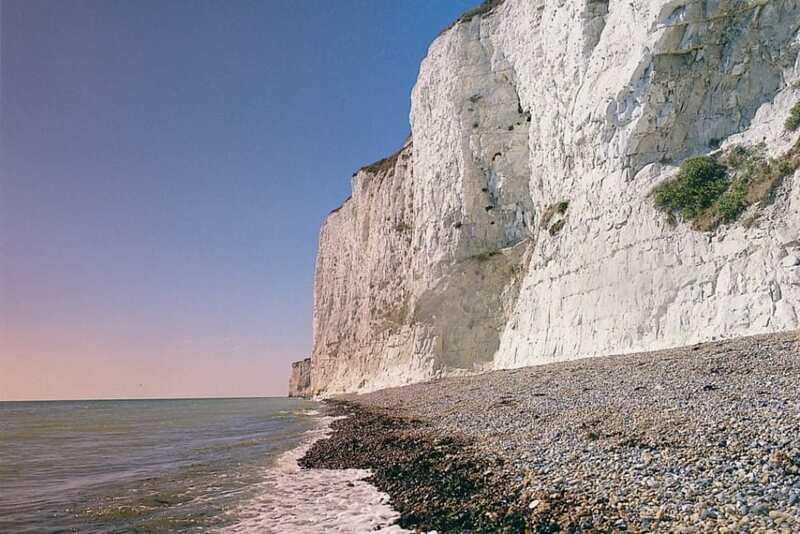 That may not seem to make much sense until you realise that one of the most spectacular coastal walks in the country takes you from the White Cliffs of Dover to the bay at St Margaret’s at Cliffe – home to Ian Fleming, creator of the Bond books. The stunning bay at the end of this wonderful two and a half mile walk is the setting for Fleming’s third Bond novel, Moonraker. As you drop down to the village from the headland, passing secluded cliff top homes with romantic names such as Hope Point, Seawinds and Windy Peak, you feel as if you’re in a land that time forgot. The gardens are lushly overgrown, there is no through traffic and down at the waterside, just a couple of stark buildings. One is White Cliffs, Fleming’s cottage which he referred to as ‘the first house in England’ due to is precarious position at the foot of the cliffs, and the other is The Coastguard, a welcoming pub selling wholesome pub grub. You can park either end of this walk – alongside the pub at St Margaret’s or at the National Trust’s White Cliffs Visitor Centre up above the harbour in Dover. The excellent NT café there is a great place to sup a hot chocolate whilst watching the constant to-ing and froing of ships and ferries in and out of the docks below. It’s gratifyingly snug (and smug) doing so in bad weather too. Once on the walk, the views are breath-taking. It’s easy to forget how high* up you are as the chalk paths undulate over the shorn grass headland, but when you look out to sea and sometimes can even see France shimmering on the horizon, you appreciate why the White Cliffs are one of the most impressive spots in the UK. Halfway along you can visit the South Foreland Lighthouse (also in the ownership of the National Trust), built to warn ships of the dangers of Goodwin Sands nearby. 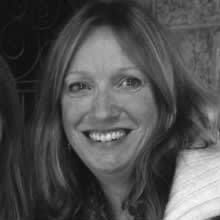 It’s a wonderful walk, offering some of the best sea views of anywhere, and made all the more rewarding by the knowledge that there’s a slice of cake and a cuppa (or a beer) on offer at either end…. The war tunnels deep below Dover Castle were kept top secret until just a few years ago. From here much of World War 2 was masterminded and the tunnels make for a fascinating day out for children and adults alike. Heading further round the coast, the next main beach worth exploring is Folkestone – about 15 miles and 24 minutes from Ashford. Many people skirt through Folkestone on their way elsewhere without appreciating there is a lovely seaside feel to the place. Head down to the Harbour and you will see that the town is enjoying a revival with glamorous eateries, a bohemian Artists’ Quarter and a theatre hosting edgy comedy shows. Top of the list is Rocksalt, a glass cube of a dining room balanced on the edge of the old harbour wall. The award-winning restaurant is run by former Claridge’s head chef, Mark Sargeant. As you’d expect from a place so (seemingly) precariously close to the sea, the fish and seafood is fresher than fresh and the kitchen prides itself on sourcing local produce from the land too. There’s a pleasing juxtaposition between the glorious, flashy architecture of Rocksalt and its salty seadog neighbours. As you walk along The Stade, a cobbled by-way running alongside the harbour, the restaurant’s immediate neighbours are whelk stalls and tackle shops. A few yards further along you come to the first of the town’s beaches, Sunny Sands, tucked in below high cliffs and home to an annual sand castle building competition. If you are lucky it’s even possible to see France from your table in Rocksalt! One of Folkestone’s best kept secrets is the spectacular Lower Leas Coastal Park, a beautifully restored take on a Victorian pleasure garden. Whilst parts of the park go back to its heyday, including The Leas Lift, a funicular railway opened in 1885 which transports you up and down the steep cliffs, a recent regeneration programme has added an impressive adventure playground for children set on the sand plus a stylish licensed café for entertaining the grown-ups. There’s also an amphitheatre which hosts live music plus eye-catching all season planting and landscaping which makes it good to visit all year round. Hythe and Dymchurch are less than half an hour from Ashford (around 12 miles) yet could be from another century. Where else could you get to meet Winston Churchill, the Green Goddess and Dr Syn all together? No, they’re not appearing in the next X-Men movie: they’re steam engines that regularly chug their way along the Romney, Hythe & Dymchurch Light Railway. 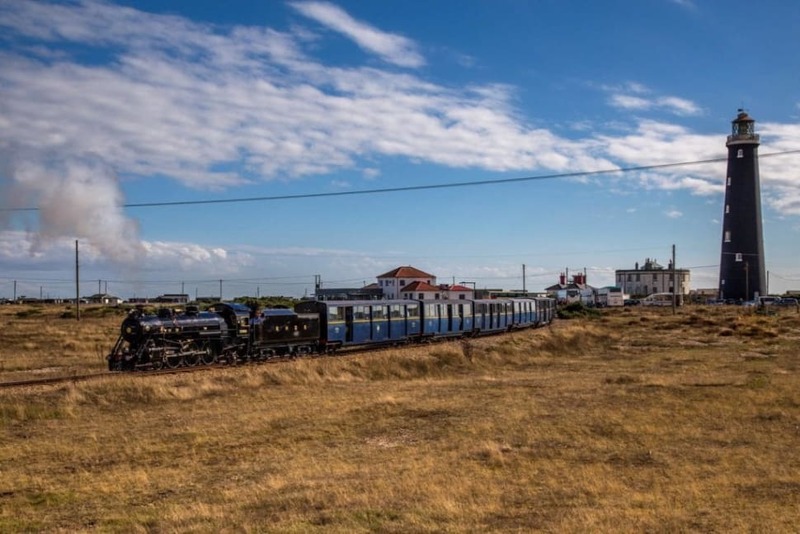 This little steam line – built in the 1920’s – is a gem of a way to explore the coast in East Kent. Running 14 miles from Hythe down to Dungeness, its scale is about a third of regular size, making it one of the smallest railway lines in the world or a ‘mainline in miniature’ (that’s a 15 inch gauge for those of you who need to know). Kids from 4 to 84 love the Romney, Hythe & Dymchurch Light Railway! Trains run all year round and you can buy rover tickets allowing you to hop on and off at the various stations (and beaches) along the way. A good place to start or finish is Hythe – the largest town on the route. There you will find an impressively banked pebble beach and a broad promenade. With far-reaching, elevated views, the promenade makes a great place for cycling, roller skating or simply strolling – regardless of the weather. If the sun is out, then by all means grab yourself some tasty fish and chips from Park Road Fish Bar (a stone’s throw from the beach) and paddle whilst you eat… There are pretty side streets close to the beach with old-fashioned pubs and a couple of hotels and restaurants. If you want to explore further, cross the Royal Military Canal and visit the main part of the town with its picturesque old buildings, cafes and shops. Toot, toot. Time to grab your bucket and spade, for a few miles down the line (or a quick drive if you prefer) comes lovely old-fashioned Dymchurch. This is a small, traditional seaside town, with a wide sandy beach, lots of cafes, parking and loos. Families and especially children love it as alongside all the usual beachside treats, including donkeys and ice cream, there is even a small funfair. Kiss-me-quick, what’s not to like? Families from Ashford have been making day trips to Dymchurch for generations and it still makes a great (traditional) day out in the summer holidays for the children. For a real get-away-from-it-all experience, head 18 miles south-east of Ashford (about 30 minutes by car) and discover Littlestone and Greatstone. It may mean that, on occasion, you just have to accept the wind as your friend, as these two quirky beaches – one sandy, one pebbly – is where you go to ‘have a good blow’. It’s also why Greatstone has a reputation as one of the best locations in the country to go land yachting. Alongside the sport though, the small town has an appealingly eccentric feel. When seaside holidays became The Thing in the 1920’s, the fashionably offbeat headed to Greatstone, attracted by its vast sandy beach. There they built very individual holiday retreats along the front. These unusual, large homes look out across the undulating dunes to the sea. Today, Greatstone’s housing is more mixed, with lots of Sixties and Seventies infill, but the wide and flat beach remains the same. It is a perfect place for a family day out, picnicking, flying kites or playing beach cricket. If you want to swim though, be warned: the distance between the high and low water marks can be as much as half a mile, so it’s best to aim for the half-way point on a rising tide or have a long walk! If having both feet on the ground and keeping dry is more your style, then Littlestone’s gravelly shingle (made of ‘little stones’ – get it?) 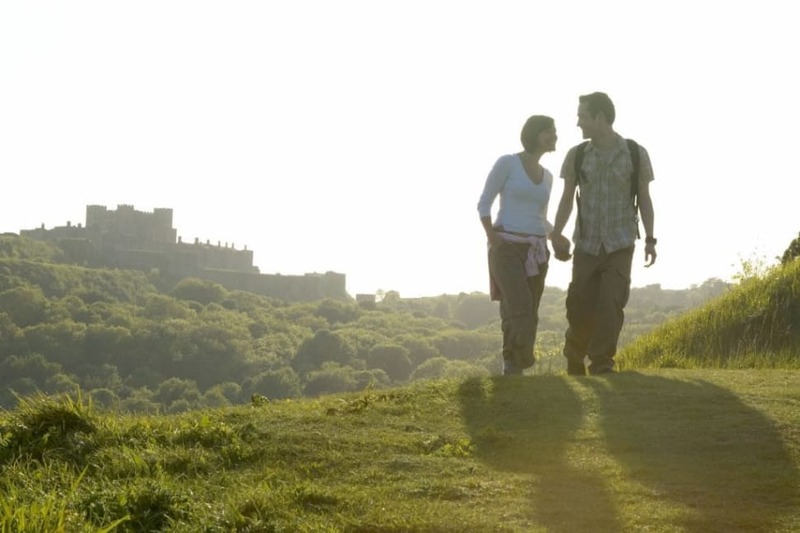 offers great walks with – on a clear day – views across to Dover and beyond. There are also the remains of part of a WWII Mulberry Harbour to spot at low tide. It was ‘parked’ there prior to the D-Day Landings but got permanently stuck on the sands. It’s now an Ancient Listed Monument – take the binoculars, have a squint and get a free history lesson at the same time. 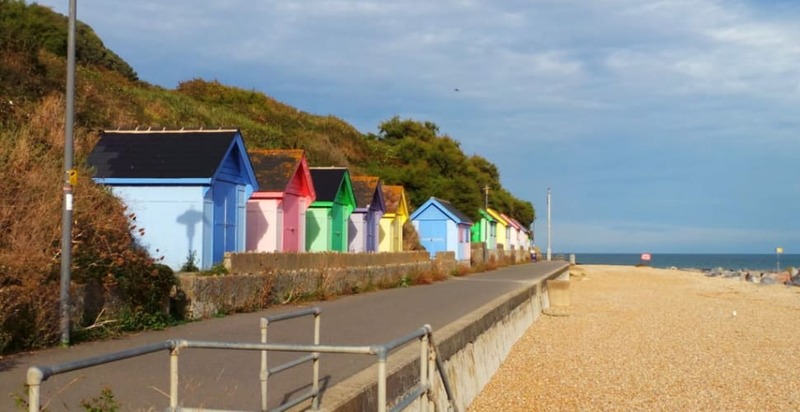 Further entertainment can be had at a fitness area for both children and adults and admiring the higgledy-piggledy brightly coloured beach huts which give the village a jaunty seaside feel. Littlestone is also home to one of Kent’s finest golf courses and is used for final qualifying for The Open. It’s a beautiful course on a summers evening when the skylarks are singing above the links. It a very difficult course too! Wheeling birds, crunching gravel and such a curious landscape you might think yourself on a lunar moon. In fact, you’re in Dungeness, just half an hour and 20 miles from Ashford. The beach there is one of the largest expanses of shingle in Europe and, as such, one of Britain’s most important National Nature Reserves. Its unique ecology makes it a twitcher’s Nirvarna, home to thousands of birds, from familiar native gulls to flocks of migratory species. There are over 600 different types of plant to be found at Dungeness too (that’s a third of the total in the whole of the UK), plus rare moths, bees, beetles and spiders…. With all that nature, it’s easy to feel pinpoint small, but Dungeness is a place of dramatic contrasts. Looming large on the tip of the headland is Dungeness Nuclear Power Station – a block of towering buildings that adds to the futuristic landscape (they’ve filmed episodes of Dr Who here, natch). It’s a tourist attraction in itself with an informative Visitors’ Centre – you need to book ahead to visit. Whilst you’re in the mood for alien experiences, check out the eerie ‘Listening Ears’. These gargantuan concrete structures set back from the shore are acoustic mirrors built in the late 1920’s. There are three of these huge monoliths – a pair of concrete satellite dishes and the other a formidable 200ft long curved wall – all squatting on the shore of a disused gravel pit. It’s possible to visit the site via occasional guided walks (see the Romney Marsh Countryside Project website for details). All this exercise is likely to be making you hungry so you’ll be relieved to know people drive for miles to eat at The Pilot. A windswept pub in a remote position, it serves excellent fish and chips – straight from the boat to the pan. You can buy fresh fish and seafood there too from the fishmongers across the road. You can see why we like Dungeness. It’s the rugged combination of nature, wonder and walking – with plenty of kite-flying and gawping thrown in for free. A bracing walk with the dog followed by fish and chips at the Pilot — the perfect Sunday! 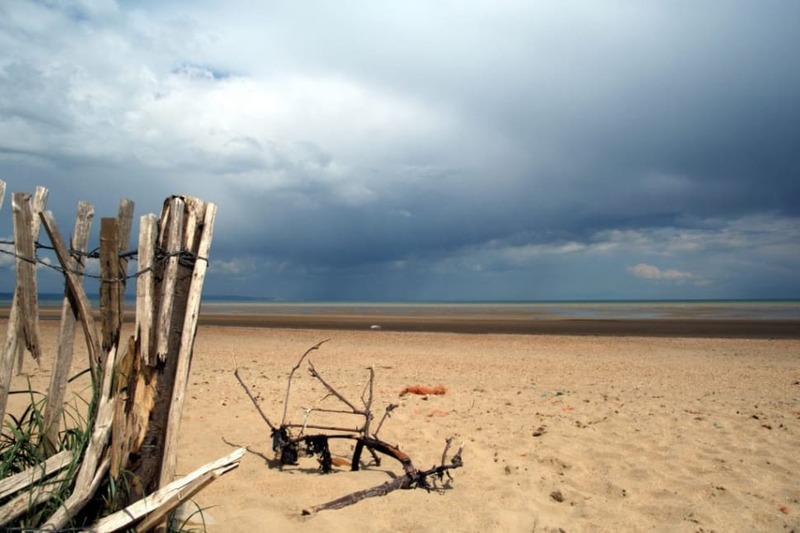 Now we’re heading back on ourselves and travelling westward along the bottom edge of Kent’s south coast, nudging over the border into East Sussex and the glory that is Camber Sands. 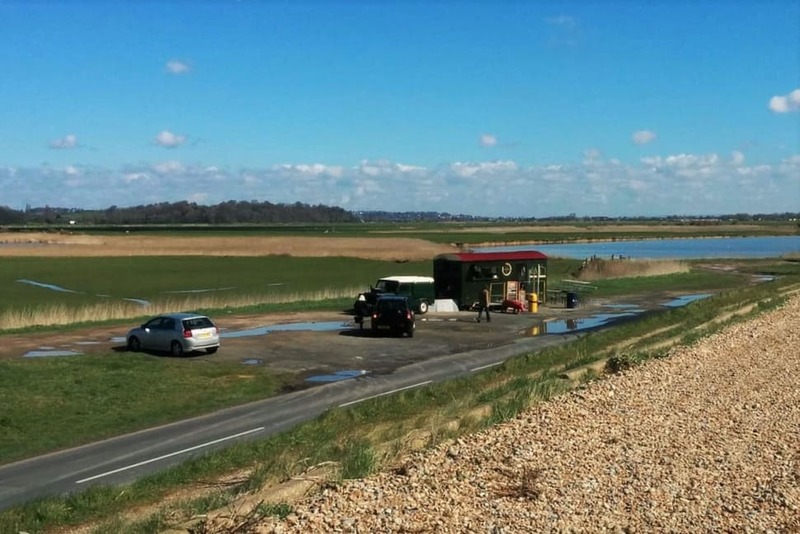 Still only 20 miles and half an hour from Ashford, it’s no surprise to learn that this vast sprawl of golden sand – 7 miles from tip to tip – has been a favoured film location for years. It set the scene for John Mills and Richard Attenborough in Dunkirk, appeared as the Normandy beaches in the epic The Longest Day and even masqueraded as the Sahara with camels for the Carry On crew. More recently the beach and its famed sand dunes have appeared in The Theory of Everything and even hosted George Clooney in The Monuments Men. Camber is an amazing beach but the rip tides and sand banks can be very dangerous. Please read the warning notices when you arrive. What we love about Camber is the vast, open space of it all. The full 180 degrees of sky above your head makes it feel as if the lid has been taken off. When the tide goes out, the beach expands into a virtually endless golden haze of sand, shallow pools and blue horizons. Even in the height of summer, there’s so much space it seldom feels crowded (although the parking can get a little snug). Aficionados looking to really get away from it all, head back east along the road towards Jury’s Gap and – ultimately – Dungeness. Pick your spot along the sea defences and roadside parking, and you can enjoy crunchy shingle stomps and a beach barbeque hunkered down behind one of the weathered wooden groynes that carve up the beach like dinosaur ribs. 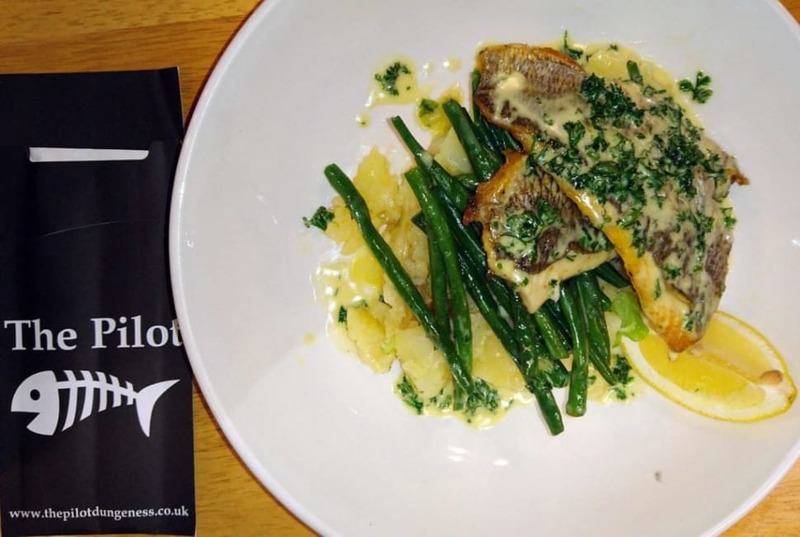 If you’d rather someone else was doing the cooking, then head for The Gallivant – a converted Sixties motel now with a hipster Shoreditch vibe and a gastro menu featuring local produce. It serves brunches, lunch and dinner and is just across the road from the beach. Set in an on-trend coastal-style garden, it’s popular and therefore best to book. For something cheap and cheerful, head to the Kit Kat Café. It’s right on the beach. It may be a bit chips-with-everything, but you can chomp on a bacon butty (white bread, duh) with your toes literally in the sand. We have sunbathed here in the summer and tobogganed in the dunes (on snow) in the winter! 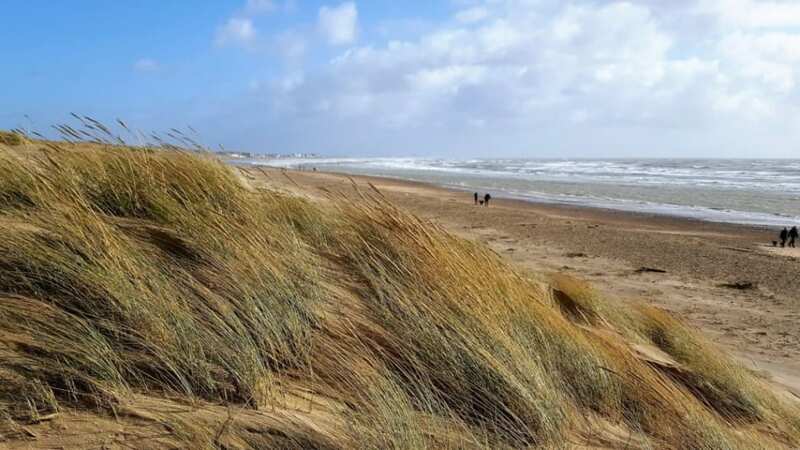 Camber Sands is a very special place in winter too — when you often have it all to yourself. Before you get to Hastings (in itself a good day out) there’s another great beach to explore. At just 22 miles away (around 38 minutes by car), Winchelsea Beach is an open stretch of shingle beach that stretches from Rye Harbour all the way down to Pett Level. It’s steep, dramatic and very, very pebbly! On a wild day, when the waves are arching dramatically, the sound the shingle makes as it is crashes back and forth is exhilarating. To add to the drama, at the southern end of this sparsely populated beach (there’s a lot of beach and not that many people), you may come across strange dark protrusions and objects below the water. This is Pett Level’s lost or sunken forest. Dating back some 6,000 years, at low tide you can identify tree roots, branches and trunks, with the occasional sapling still poking upright. Most people who visit Pett Level are not really aware of what lies beneath their feet, focusing more on the plentiful rock pools. The best time to see this unique geological phenomenon is during a really low tide or after a storm, when the ancient trees emerge or get broken up (they’re quite soft still as they’re not yet old enough to be ‘petrified’ although some locals refer to them as such). Aside from the beach itself, on the other side of the solid sea wall that protects the road from the coast, lies flat marsh land filled with flocks of birds and grazing sheep. It’s a view that has remained unchanged for hundreds of years. There are plenty of footpaths and bridle ways to help you explore this beautiful landscape. And if you need sustenance to keep you going whilst out amongst all this nature, there’s a quirky pit-stop in the form of The Red Pig, a converted railway carriage parked every weekend in a layby opposite the beach. Hearty snacks such as Pulled Pork with homemade Coleslaw are served alongside their signature Pett Leveller – a hefty ‘hot-dog’ made with a proper sausage from a local butcher. Yum.